Blaklader FR pants will withstand the most aggressive jobs and keep you protected on heavy duty work sites. This hi vis jacket keeps true to its name as a trusted way to stay safe and comfortable at the same time on the job. The yellow-green or safety orange-red color choices paired up with the 2 inch silver reflective tape make for great visibility. At Contractor’s Solutions, we carry a variety of FR Clothes to suit all of your Flame Resistant Clothing needs. Whether you are an employer or an employee, you can find the flame resistant work wear you’re looking for in our wide selection of pants, shirts, and outerwear. Flame Resistant Clothing is useful, and often required in many industries where there is a high risk of fire. These industries include oil and gas drilling, electric utilities, and many others. The most severe burn-related injuries in these environments are often made worse by clothing that still burns while on the wearer. FR clothing will not ignite or burn, making burns and injuries much less severe for the wearer. Our FR clothing options include traditional work wear—i.e. pants and shirts—along with high visibility outerwear, including raincoats, vests, and overalls. These products are suitable for industries that require both flame resistantcClothing and heightened visibility. High-visibility FR clothing from Electra and Comfort-Brite offers resistance to flash flames and electric arc hazards. All of these items have undergone rigorous testing to ensure that they will not ignite and burn. Many of these items are also waterproof, making them perfect for working in hazardous weather. Our traditional work wear offerings include pants and shirts in a wide variety of styles, colors, and sizes. 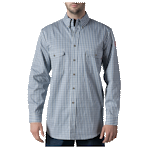 Plaid and solid shirts from Dickies offer both flame resistance and a comfortable shirt for working. These shirts are flame resistant and arc resistant, making them a perfect layer for workers in a number of industries. 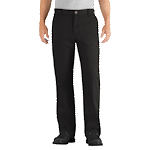 We also offer work pants from Dickies in several different colors and materials. 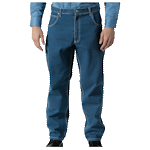 Carpenter jeans and twill pants both offer fire retardant qualities and a wide range of motion for working. 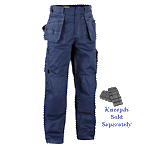 We also offer work pants from Blaklader that include cargo pockets and other utilities. We offer a wide variety of FR clothing, from shirts and pants to raincoats and overalls. Each of our fire resistant offerings provides safety and peace of mind to its wearer. Employers and employees alike will appreciate the benefits of flame resistant work wear.